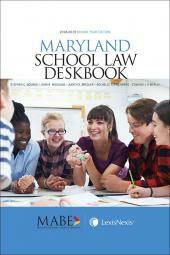 The Maryland School Law Deskbook is the first education law reference of its kind in the state. Written by experienced education law attorneys, and published in cooperation with the Maryland Association of Boards of Education (MABE), this comprehensive publication offers current and authoritative information on legal issues facing schools within the context of state and federal education law. 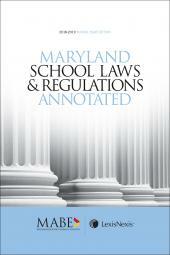 Maryland School Laws and Regulations Annotated provides fingertip access to a collection of education-related statutes in one handy volume! Published in cooperation with the Maryland Association of Boards of Education, this up-to-date publication offers quick reference to important statutes contained in the Education Article of the Annotated Code of Maryland, as well as other Articles such as Criminal Law, Criminal Procedure, Election Law, Family Law, Health, Public Safety and much more. In addition, the publication offers comprehensive coverage of Title 13A of the Code of Maryland Regulations (COMAR). Purchase Maryland School Law Deskbook and Maryland School Laws and Regulations Annotated together and save! 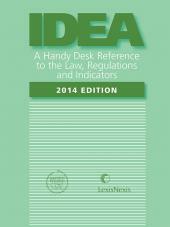 For more information or to order, Call 800.533.1637 or www.lexisnexis.com/us. John R. Woolums is an attorney and the Director of Governmental Relations with the Maryland Association of Boards of Education. Since 2001, he has been responsible for conducting the Association's state and federal lobbying activities on behalf of Maryland's twenty-four boards of education. John is a 1995 graduate of the University of Maryland School of Law and is a member of the Maryland Bar, Maryland State Bar Association, and national and Maryland Council of School Attorneys. John is a 1987 graduate of Miami University in Oxford, Ohio. After graduation from Miami University, John worked for five years as a legislative aide to U.S. Senator Barbara Mikulski. Upon graduating from law school, he worked with a Washington, DC law firm in 1996 and as committee counsel to the Maryland House of Delegates' Environmental Matters Committee in 1997. Prior to joining the Maryland Association of Boards of Education, John was the associate director of the Maryland Association of Counties from 1998 to 2001. Stephen C. Bounds is an attorney and is currently the Director of Legal and Policy Services for the Maryland Association of Boards of Education, and is the administrator of the Maryland Legal Services Association. Steve provides education law and policy information, training and assistance to Maryland school board members and school system staff throughout the state. Steve served on the Howard County Board of Education from 1994-2000, including as its chairman and vice-chairman. Steve is also an adjunct graduate instructor in school law with McDaniel College and Towson University. Steve received his B.A. from Furman University in 1977 and his J.D. from the University of Maryland in 1980. Steve is a member of the state and national Council of School Attorneys. Judith S. Bresler is a partner at the law firm of Carney, Kelehan, Bresler, Bennett & Scherr, LLP and an adjunct professor, teaching school law, at Johns Hopkins University and Goucher College. She received her undergraduate degree from the College of Education, University of Maryland, and her juris doctor degree from Washington College of Law, American University, in Washington, D.C. She is a frequent speaker on school law issues and chair of the Maryland Council of Local School Board Attorneys as well as a member of the National Council of School Board Attorneys. Edmund J. O'Meally is a member of the law firm of Pessin Katz Law, P.A. and teaches school law at Johns Hopkins University, Goucher College, and McDaniel College. Since 1986, Mr. O'Meally has represented school boards and superintendents in collective bargaining negotiations, employee discipline matters, discrimination litigation, First Amendment issues, special education hearings and litigation, construction and procurement issues, Public Information Act and Open Meetings Act compliance, sports injury litigation, student suspensions and expulsions, sexual harassment, and Title IX. He was a 1984 graduate of the University of Maryland School of Law where he served as Executive Editor of the Maryland Law Review. Mr. O'Meally clerked for the judges of the United States Court of Appeals for the Fourth Circuit upon his graduation. Rochelle S. Eisenberg is a member of the Maryland law firm of Pessin Katz Law, P.A. She has practiced education and employment law in the public and private sectors since 1977, representing school systems and employers throughout the State of Maryland. She is a past President of the Maryland Council of School Attorneys, has taught at colleges and universities, and has provided over 250 seminars on school and employment law. Rochelle is a graduate of the University of Maryland, College of Education, and the Washington College of Law of The American University, where she was a member of The Law Review.